Animals Flat Icon SVG File, elephant, camel, moose, rhinoceros. every $4.50 worth of downloads! 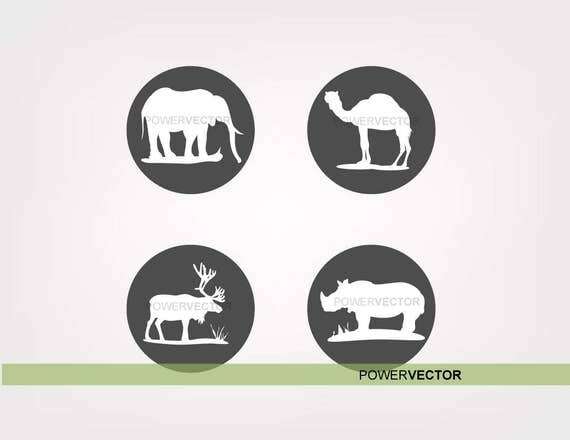 Animals (elephant, camel, moose rhinoceros) Flat Icon SVG Cut File is perfect for cutting or printing purposes. Now Available through digital download on my etsy story, POWERVECTOR. Use this design for your own physical or digital projects, this is compatible with your Silhouette or other cutting machines. Best for for cutting, stickers, cards, Wall Decals, apps design and more! Avail of my $0.50 OFF for every $4.50 worth of download promo! Just use "POWER1VECTOR" code to get it. This promo is good from 15 March 2017 to 20 April 2017.